We are two Australian artists, Michael Cartwright and Shona Nunan, who have been together over the last thirty years. 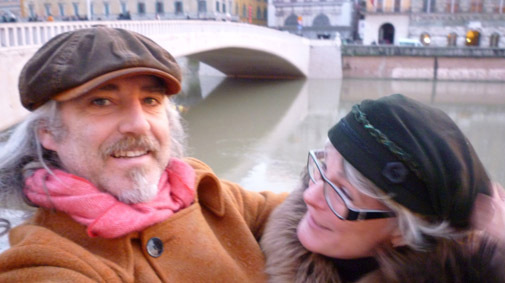 Although both of us have been painting, drawing and sculpting since we were children, (we both came from artistic families – fathers who were painters), and we did art courses, I think we could both say that our true commitment to art came when we went to Carrara in 1984. It was at this point in our lives that we made the decision to pursue our artistic endeavours and gave up working for wages. We were young and impassioned and had great artists before us, Vincent Van Gogh, Michaelangelo, Picasso and we wanted to be great, to follow in their footsteps. Italy gave us that first irrevocable step and we have never looked back. Our first sojourn here was for seven months. We were very poor, had no hot running water or shower in our rented house, but we both had studios, Michael in a marble carving yard at first in the famous Nicoli studio in Carrara and later a cheaper space in Avenza di Carrara at Bertinini’s, and I had my studio in the big empty room above our living quarters. It was a magical time. We arrived here in the dead of winter. We had our first born, Jacob, with us and he went to the local Nido every day while we worked. We learnt to be self disciplined and we became each other’s greatest critics. It began the great adventure of our life. It took a few years before we could go back overseas. In the meantime, we kept working in the countryside of Canberra and later Victoria. We had exhibitions in some wonderful galleries: Bitumen River (now known as Gormon House in Canberra), Holdsworth Galleries in Sydney, Meriidian Gallery in Melbourne, Ivanyi Gallery and Renard Wardell Gallery in Melbourne, Mandarin Gallery in Hong Kong and Art 2 in Singapore. There were more exhibitions than I can think of now, but eventually we were back overseas again, visiting Hong Kong and China, getting artist residencies in southern France, Ireland, France and always visiting Italy and dreaming of the day we would return here to live. One day, we were invited to the birthday party of a very dear friend and collector of our work. She is a magnificent lady, in her eighties, romantic and full of vision. She loves Italy and Lucca is her favourite city. Her desire was to have a party over four days in one of the villas outside Lucca. We knew Lucca well, always stopping to walk through its ancient cobble stone streets, visiting the markets, or picnicking on the walls. There was some ingredient in this party that completely altered us. I think it was the joyous abundance of the celebrations. There were opera singers serenading us over the formal lawns of Villa Grabau, cradled in the foothills of the Appenines, medievali dancers and acrobats, classical piano throughout. The first night we feasted in the magnificent limoneria of Villa Grabau, the vines dripping from the ceilings of the old barn and lit by candles, the company glittering and laughing… It was so romantic. It was a feeling of joy for all. It was the feeling that life was short and it was better to follow your dreams than to wait for the moment when you thought you could be free…. We sat on the walls of Lucca, picnicking in the Autumn sun, a respite between party events. We looked out at the distant hills and we made a vow to each other that we would return, that we would come back within six months and buy a house in those distant hills. And we did. Six months later we placed a deposit on our little house in Pieve di Monti di Villa. Our life is here now. Our children have followed us. We have two boys, Jacob, is a composer and photographer and Sollai, is sculptor and writer. Friends and family come to visit. We are inspired by a living culture and have easy access to all of Europe and we are enriched. Our art is growing. 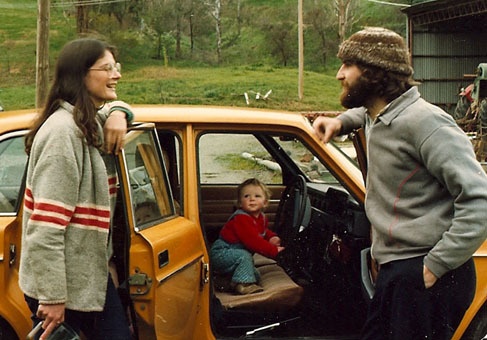 Shona and Michael with their son Jacob, in the beginning. I am putting together lesson plans for secondary schools about river environments – I was wondering if I could have permission to use your photo on your blog of rubbish along the Murray River. I would credit the photo to you and send a link to the lesson plan.